Alan Alda will be so happy! The reviews for the book better use the same words. Does this have to do with the sudden halt of the What If? updates? I’m sure it does. What-Ifs began going up days late or not at all last year around the time that he announced the What-If book, so he must be spending all his time working on explaining things in basic terms and drawing pictures. I can’t wait! Randall’s probably on the New Horizons go-far-space-traveller and he can’t work on writing words because he’s happy about Disney-dog-space-rock! Do you have a link to the list of those 1000 words and an explanation of how it was determined that they are the most common? So, was Thing Explainer written with the editing tool inspired by the original Up-Goer Five comic? Recursion joke goes here. So, was Thing Explainer [NOT ALLOWED WORD] written with the computer word writing thing http://splasho.com/upgoer5/ [NOT ALLOWED WORD] written because of the Up-Goer Five picture? ‘Computer work thing that works by using work from same computer work thing ‘ joke goes here. I checked and that spellchecker/dictionary doesn’t like “Explainer” Is there an exception for derived words? i.e. does only the root word have to appear on the list? If so, a simple dictionary check is not sufficient. the supertitle does specify that the title is in “big words.” they might be an exception. I want your stripped down spellchecker dictionary! Definitely worth the lack of new What If? entries as of late. Looking forward to learning all sorts of interesting things/puzzling out what Randall is actually trying to say. Sounds Great although I’d second the question, How appropriate will it be for kids? The Amazon description says it’s for ages ‘5 to 105,’ and the What If? book is clean, so I imagine it will be fine. All deep puzzles are appropriate for kids. If the jokes are subtle and the reasoning hard, work it out with them. Or…. let them work it out. The deepest and most important puzzles are easy to state, although they are also given two-dollar names. Every infant has to come up with a comprehensive set of answers, and change many of them over time. Hmm … attempting to “Reblog”, but the dialog is off screen to the right on my iPad. ??? Any plans for a UK publisher? Now if Mr Munroe would kindly create a webpage that converts legal and financial gibberish into 1000-common-words plain English, we could all find out what our banks, economists and politicians have been talking about all these years. “what our banks, economists and politicians have been talking about all these years”. Call me cynical [a hurt dog that has lost all trust of his “masters”], but what they have been saying is: “give us more money and more power, because we always promise you things we will never give you but you still believe us”. I wonder: How many things are explained or how many pages will the book have, approx.? I wonder: How many things are explained / how many pages will the book have, approx.? Would you be okay if the editors at simple wikipedia used your book’s explanations for a few articles? My child self is confused by the idea that I had this version back when I might have had legitimate problems with words. Survived nonetheless. Spanish, Chinese, whatever. I wonder whether Randall would give permission for a Lojban translation. Lojban is an artificial language originally designed to make mathematical logic speakable. It is based on relations, and has no nouns (except for names), verbs, or adjectives as they are understood in almost every other language. Klingon would also be of interest. They use a lot of up-goer things, along with changing shape of space to go fast things and hiding from seeing them things and making things into many smaller things things. I am so so so excited about this because I’m a foreign language teacher, and for that reason Up Goer Five has long been my favorite xkcd comic. I use it to teach kids about circumlocution, which is a really important skill. It’s the ability to ‘talk around’ words you don’t know, and find other easier ways to get the same point across. So I always show them Up Goer Five to demonstrate that you can explain something really complicated by using only simple words that they already know in the language. So I’m excited to get a copy of this book to show my kids! If you have a line and draw another line that shows the area under it and then draw a third line that shows how fast the second line changes, the third line is the same as the first line. Take a field and make a group out of all of the ways you can move the field onto it self where two ways make a new way by doing both one after the other. You can look at any smaller group in your group to find a matching smaller field in your field that is moved onto it self by all the things in your smaller group. Also, if you take any smaller field of your field there will always be a smaller group of your group that has all the ways you can move that field onto it self. On one hand, the second one is cheating by using extremely technical definitions for common word on the other hand, it’s pretty great how many simple words are used in complex ways. Ok, and I also cheated by splitting up “itself”, but it still communicates the idea. Figured it was better than attributing gender to fields and groups since “himself” and “herself” were on the list. “Its self” is allowed, and technically grammatical. Still not Listed on Amazon.ca. Might want to let your publisher know. I really enjoyed reading What-if and read it often because I am not able to read it without laughing. This book may even be more fun to read because it will take a longer time to understand some of the jokes and mention of the thing that is an area of study and also a (thing that is on trees with leaves on) of knowing things. I must say, you have set yourself a very hard job to complete and I wish you the best of (that thing that some people believe in when they throw away their money in a place where they place a (money down on table to be returned if the person was right about their point of thinking)). Not that you need it. I hope there will be group of people who set this book free in the place next to that larger place and across a large area of water from that place that has a place with a tall thing that many people take a picture of themselves in front of and believe to be the most loving place in the world. However, my place where I live that is across the large area of water is known for its bad water that falls from the sky even during summer and has a person who wears a high number of money to buy thing worn on head who has people outside with tall black soft things on their heads and red things they wear. The place is also known for drinking a lot of drink made from leaves that are grown in a different place and are thought to be able to be read to tell a person about what their time ahead of now will be like. If the above words I used were not clear enough, I am sorry. Your book is going to be great. I really am not able to wait but I will because I know that the longer you spend making it, the better it will be. Thank you, and this was much harder than I thought it would be so I think you are great to try it as long as you enjoy it. Hope to buy it soon. Could you please consider your Northern Neighbours for the inevitable book tour and stop by Montreal, please? 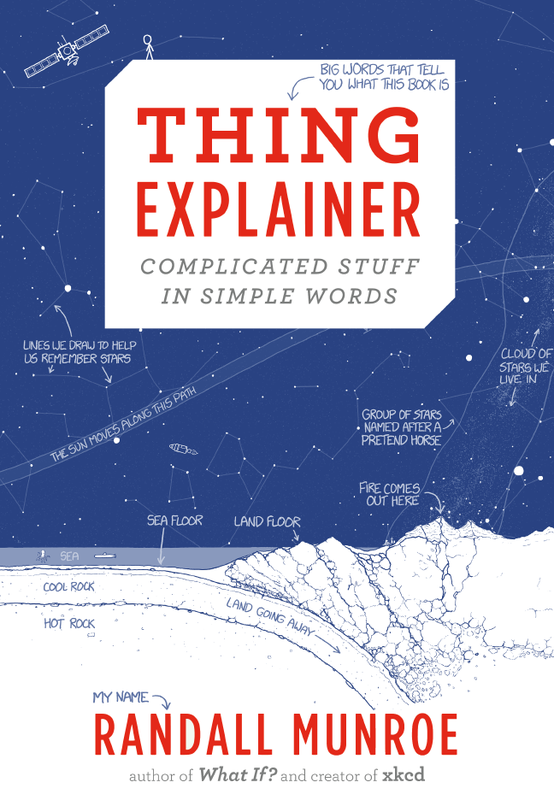 Thanks for finally writing about >New book: Thing Explainer | xkcd <Loved it! Will the translated version also only use the thousand most common words in that language? I was wondering that too. That seems like a LOT of additional work. Much harder than a normal translation. Number 16 in Amazon UK bestseller list 6 months prior to release! Go Randall! Someone needs to create the “thing explainer” app that translates text in to the thousand most common words. I’m sorry I’m missing it, but out of curiosity, does the book also include the Up Goer Five? One Question: Did you use “think piece” to replace “brain” a la https://xkcd.com/1420/ ?? Have blogged about you and done a youtube. Please come to SEATTLE on book tour. What is the font you use for your xkcd comics and What If? diagrams? Do you write it that way or is it a font? Why is there a volcano on the most unlikely place (thickest place unter earth) on the picture? I would love to pre-order then buy Thing Explainer from a bookseller which pays fair taxes in Britain. Does anyone know one ? It’s still too early for that, but you should be able to order it via Hive (hive.co.uk) nearer to release. Will there be an ebook option? The flaw with this is it gives you information to facilitate understanding but you end up sounding like an idiot because you don’t know the names of the things being explained. “The thing that stays on the other world” could be anything. Knowing it is the lander module at least allows you to look it up to learn more about it. I certainly hope the book labels the picture with both the real names of things and the “what are they” explanations to maximize the value of the book for actual learning. Is a russian (or ukrainian =)) version planned? i want a thing, so i will order it! I will be happy when I get this book for explaining things.The writer is good at telling smart jokes. I like his other book talking about things that don’t happen. I also like his funny drawings. Can we use this book to generate XKCD-strength passwords? My kid and I are psyched for this! She’s nine and we play a game where we can’t use words of more than one sound—no, more than one beat, if you know what I mean (yes, like in this note here). It’s fun, and it’s a bit hard! currently #41 on amazn best seller list…we can do better than that, on a side note What If is at 36! two books on the top 100, go Randall!!! Oh, another book, I can’t wait! Can I buy it for book-without-paper*? *book-without-paper: a book, which has no paper in it, but makes the words appear on a small white window.